This week I have finally written up lots of the posts that I've been meaning to write up for ages and Miss T has helped with most of the cooking so I'm going to link them all here and then link this post up to Kids in the Kitchen. The one that is exceptionally good fun to make with the kids and involves CHOCOLATE is the edible chocolate playdoh recipe - so that is definitely worth a look. You can find that recipe here. Miss T also helped cook a couple of Vivek Singh's recipes and it just shows that kids can get involved in savoury cooking too - not just cakes and cookies. 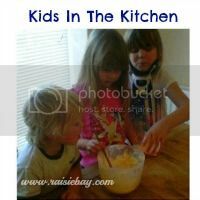 You can find out how she got on here in our post 'Cooking Savoury meals with kids'. Next up were Heston Style scotch eggs with a runny yolk. There wasn't much Miss T could do to help in this recipe but she did still manage to find a way of getting involved. See the blogpost here. I made some yummy donuts whilst Miss T was having her nap one day but she still looks cute posing with the plate of donuts so I'll include that link here too. When I picked up a copy of The Primrose Bakery's Cupcakes recipe book from our local Oxfam bookstore, me and Miss T got stuck into trying out the recipes. Here's how we got on. And last but certainly not least, we were so inspired by Little Man's Soda Bread a few weeks ago in Kids in the Kitchen, that we decided to have a go ourselves. Ours didn't turn out all that well - You can see what I mean here. Your runny scotch eggs look delicious. I can imagine them with lots of ketchup and homemade chips. Yum!